I’ve been making this recipe for a long time and it is a really useful recipe to have. The original recipe came form Fitter Food by Keris Marsden and Matt Whitmore so all credit to them for this great recipe, definitely check out their website fitterfood.com for more great recipes. I’ve adapted how you make this recipe purely down to how the courgette is prepared. 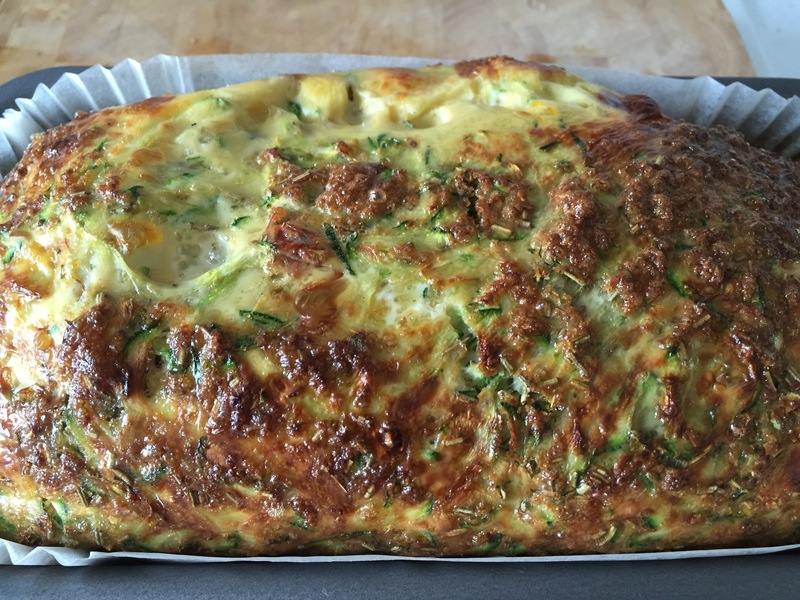 Any recipe which uses courgette is generally a wet recipe because courgette has a lot of water in it; this is a common problem when making courgette cakes as the batter will be much wetter than conventional cake batter. When I make this recipe the first time I found that all the courgette sank to the bottom of the loaf which wasn’t great, however I have a solution. 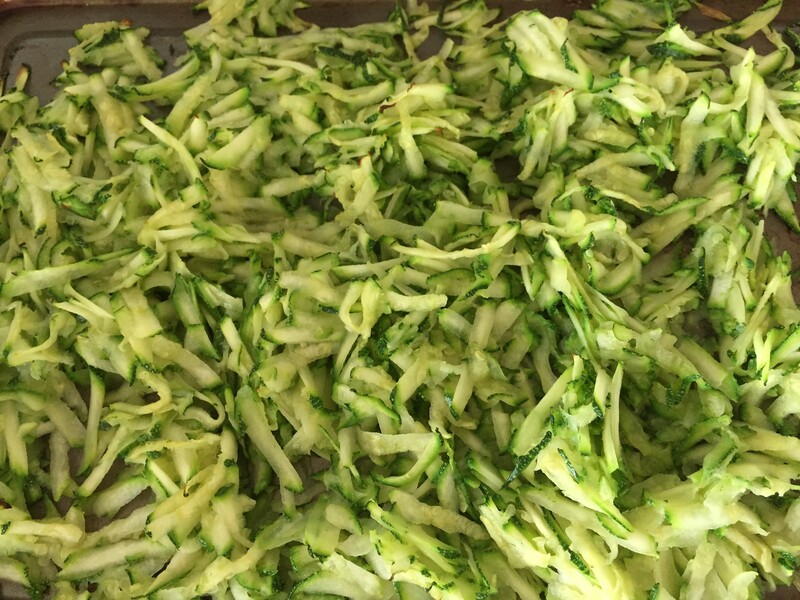 The trick is to grate the courgette and then spread it out on an oven tray and cook in the oven for 10-12 minutes to dry them out a little bit. You don’t want the courgette to crisp up, it’s simply to dry it out. The recipe is great for night shifts as you can make it on your day off and it keeps for up to three-four days afterwards. All you need to do is cut a couple of slices off and take in some vegetables with you (I personally take in my Ratatouille) and you’re set for your shift (food wise that is). Anyway, lets get down to the recipe! Preheat your oven to 200°C Fan. Grate the courgettes and place onto a large oven tray ensuring it is spread out evenly. Put on the middle shelf for 10-12 minutes to dry out, if the outer edges start to burn don’t worry. In a large mixing bowl, add the 10 eggs and season well with salt and pepper before whisking them all together. 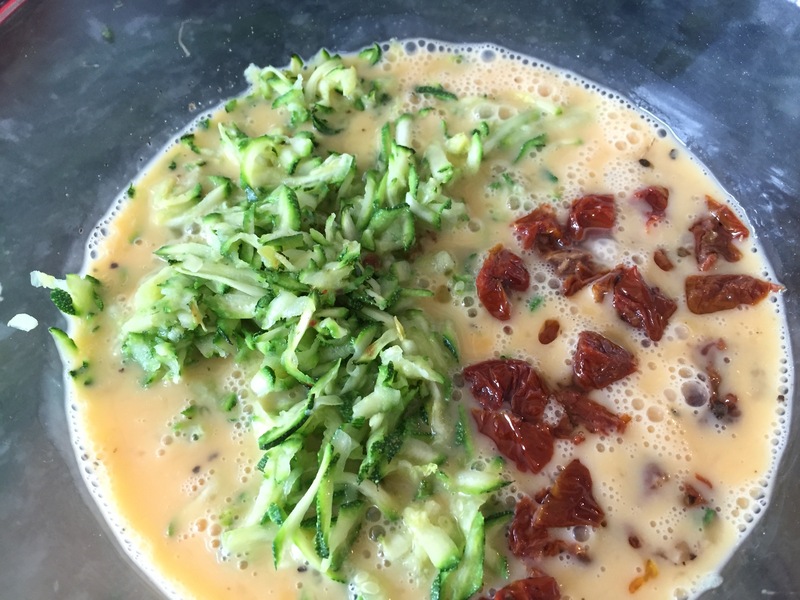 Once the courgette is finished add that to the eggs along with the sundries tomatoes, garlic and rosemary. Ensure it is mixed well. Line a loaf tin with greaseproof paper or with a loaf liner and add the mixture. Feel free to space it out over two tins if you want to make it go further but only fill half way. Cover the loaf tin lovely with tin foil and cook in the oven for 35 minutes. After 35 minutes remove the foil and cook for a further 20 minutes. Putting the foil on top will stop the top from burning due to the heat of the oven. Once cooked remove it carefully from the loaf tin, remove the greaseproof paper/loaf tin liner and allow to cool on a wire rack. Once cooled, slice and serve or refrigerate as you see fit, and above all, enjoy. As you can see, an even spread of courgette!